It's Fuki, who is the last writer of this blog relay. What..40 degrees in Vietnam!?...OMG! It sounds pretty boiling but it's also very hot here in Japan. Many of you enjoying summer holidays? Do you know one of the traditional and major gift-giving season has come around? Yes, OCHUGEN! 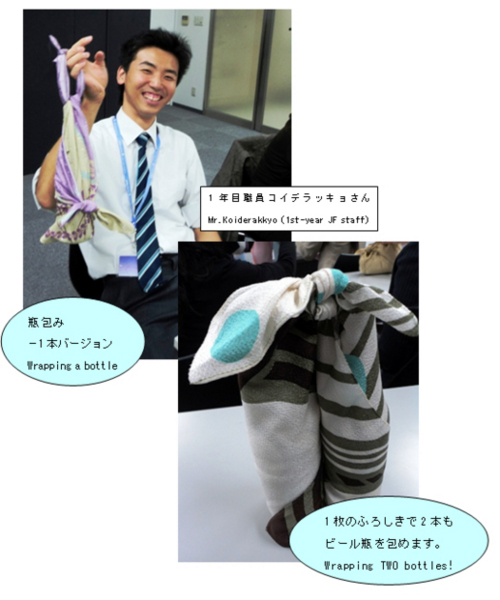 Today's topic is Japanese wrapping clothes -FUROSHIKI. 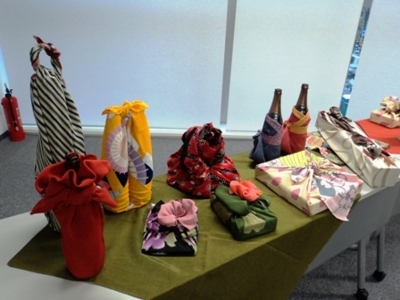 In commemoration of "Japan Year 2010 in Turkey," The Japan Foundation and Embassy of Japan in Turkey co-organize Furoshiki Design Competition for students in both countries who are studying design at colleges and vocational schools. 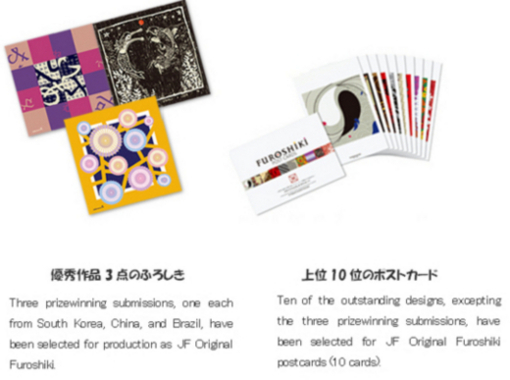 The winners will be announced in September and two best designs will be used as the memorial Furoshiki cloths. Application period: Thursday, July 1 to Monday, August 16, 2010. The Japan foundation dispatched the three Furoshiki specialists- Ms.Satoko Ozaki, Ms.Hiroko Handa and Ms.Shizue Murata -to Vietnam and Indonesia for Furoshiki workshops in March 2010. After coming back to Japan, they made presentations how their activities went in those countries with interesting foundings -In Indoesia: they hardly "knot" but "twist and fasten" with clothes, while we always knot, knot, knot...in Japan. In vietnam, there are lots of young people coming to the furoshiki workshop! 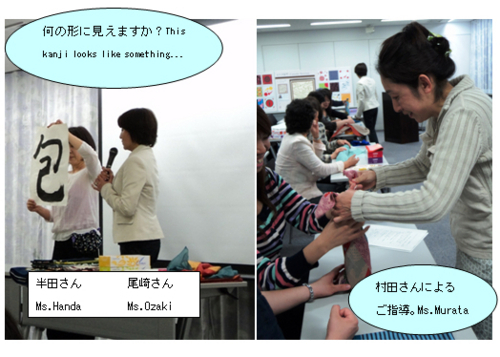 After the presentations, we had Furoshiki wrapping workshop! To begin with, we use the kanji “包” meaning “wrapping” in Japanese, but do you have any idea where the kanji came from? Here is the answer ….. The kanji “包” looks like a baby inside its mother's womb, doesn’t it? You see, wrapping is full of mother’s kindness. More interestingly, each pattern of furoshiki has a meaning, for example, a pattern of carp-shaped streamers means a wish a good-health to a baby boy, etc. Hope you enjoy Furoshiki in summer! Thanks a lot for reading. Let's get back to the first writer, Hana!